Over a year ago, a local shop told me I needed the rear struts replaced to pass inspection. It sounds like they replaced only the struts, not the springs or any of the hardware. Before I took it in, the car was making a "clunk" noise when going over bumps in the back. I'd gotten used to it, however, after the strut replacement, I expected this to be fixed. It wasn't. I'd read on this forum that clunking can result if the large bolt on top of the strut (the one visible inside the car) is not tightened properly. The Hayne's manual lists this as 188ft-lb, which is a lot. Guess what--when checking it today, I had to twist to get either of them to 50. 1. When attempting to get one to about 100, the bolt began and the rubber thing that is also visible around the bolt began to turn. Did I make a mistake in attempting to tighten this from within the car? 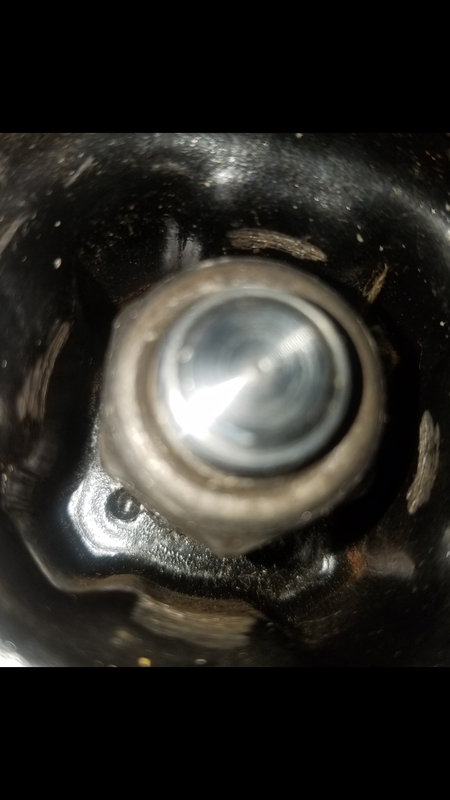 Is there something that needs to be held with a wrench underneath this bolt in order to get the desired torque? 2. The Hayne's manual also lists the three nuts surrounding this large bolt ("strut to body nuts") as 83ft-lbs. This seems really excessive for the size of the bolts. Can anyone confirm this? I didn't want to strip one so I didn't tighten it this much. 3. This is over a year later, so I don't know that I can expect anything from the shop. However, what are my options? I don't possess the know-how or tools to do a tear down of the rear suspension, and don't want to pay for another alignment. Strut upper mounting bolts = 29 Ft-lbs. I think these are the 3 bolts you refer to. Strut to suspension support (Damper shaft nut) = 36 Ft-lbs. I think this is the one bolt in the middle at the top, that you refer to. on page 10-1 the only high torque value is for the strut to AXLE carrier nut/bolts at 188 Ft/Lbs. on page 10-2 the only high torque values are for the suspension arms at 134 ft-lbs. You are absolutely correct. I'm not sure what I was looking at earlier, but it's plain as day to me now. Got everything at the correct torque, glad I didn't damage anything. Thanks for taking the time to look that up. this Bolts can be tight without need to remove the struts from the car! "1. When attempting to get one to about 100, the bolt began and the rubber thing that is also visible around the bolt began to turn. Did I make a mistake in attempting to tighten this from within the car? Is there something that needs to be held with a wrench underneath this bolt in order to get the desired torque?" The end of the stud should have a hex recess into which you can put a hex wrench to hold the stud while you tighten the nut with a box end wrench. then have to remove it from the car! Is this do the job ! very neat tool! Allows allen wrench to be held in the end of the stud while using a torque wrench on the nut. Last edited by norm356; 04-17-2019 at 05:37 PM. This is what in my rear strut 21mm nut ! That what comes with KYB strurts. Last edited by Good Wishes; Yesterday at 10:53 PM.